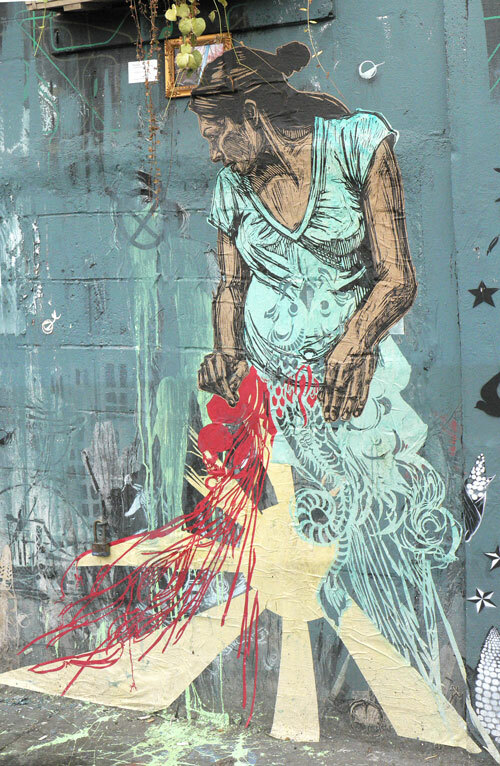 Meditative focus becomes very apparent in the life and works of Swoon. I really enjoy the sketchy-like lines of her work because it is something refreshing and totally different to the works that i have been seeing as of late. The first time i saw her work was when she was apart of the street art display at the contemporary museum of art in downtown san diego. It was really cool to see an established museum take the responsibility of letting artists do their street art in the actualy streets without getting into trouble. i can relate to Swoon because when i do my artwork i like the space to be quiet and my own without any outside interference from people, cell phones, the TV and so on. she stated that if she doesn’t get the time to herself “I’ll F***ing freak out” and i thought it was interesting to se that she could say that after speaking about being in a state of meditative focus, basically just two evils playing against each other at the same time. needing the world and wanting to get away from it all in one. Her passion for making things is another thing that i enjoyed because she became consumed by her work and the things that she was doing and i believe that only your best artwork comes out of the things that you are truly engrained in. if you don’t care about it then it isn’t going to come out well. I agree if you are not consumed or avidly living in your work than it falls short of amazing and that is what her work is. I too saw her work in San Diego and loved the exhibit. This entry was posted on February 9, 2012 at 2:40 am and is filed under Uncategorized.You can follow any responses to this entry through the RSS 2.0 feed.You can leave a response, or trackback from your own site.